A new analysis in PNAS finds that 139 U.S. counties are at risk of a “pollinator mismatch” between the abundance of wild pollinators and the acreage of pollinator-dependent fruit, nut, and vegetable crops. 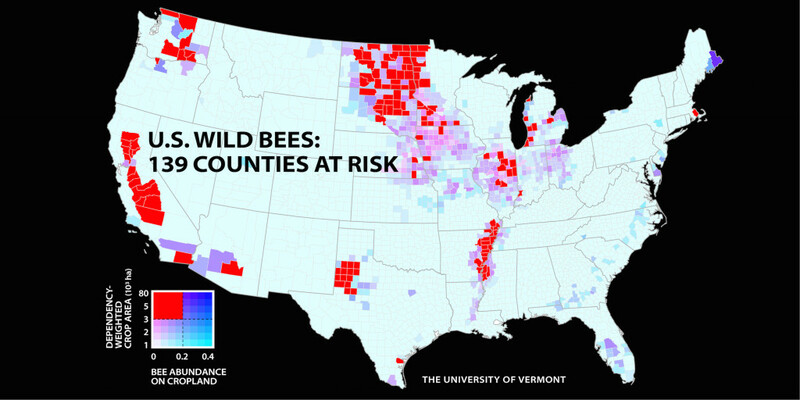 Highlighted regions on this map have high demand for crop pollination by bees, but low predicted wild bee abundance. • Counties with significant mismatch between crop pollination needs and wild bee abundance should be targeted for private and public habitat programs to support pollinators. • Investment in monitoring programs is needed to understand future status and trends in wild bee populations and to reduce uncertainty about this in regions with limited information. MEDIA CONTACT: Basil Waugh, Communications Officer, Gund Institute for Ecological Economics, University of Vermont, Tel: 802-656-8369, Email: bwaugh@uvm.edu.